1. Try something new and go tubing: Whether you’re a pro or haven’t been on the mountain since you were a kid, it’s one way to keep your pulse pumping with your partner. Most ski resorts offer this activity, and since you have the option to stay a few hours or an entire weekend, coasting down a hill just may turn into that surprising romantic getaway that you’ve been craving. 2. Create some fun in your own backyard: Get all bundled up, venture outside, and make snow angels or build snowmen with your cutie. Better yet, when your mate turns their back, you’ll have the chance to start a snowball fight. A little activity and some healthy competition will keep your blood flowing even during the coldest of days. 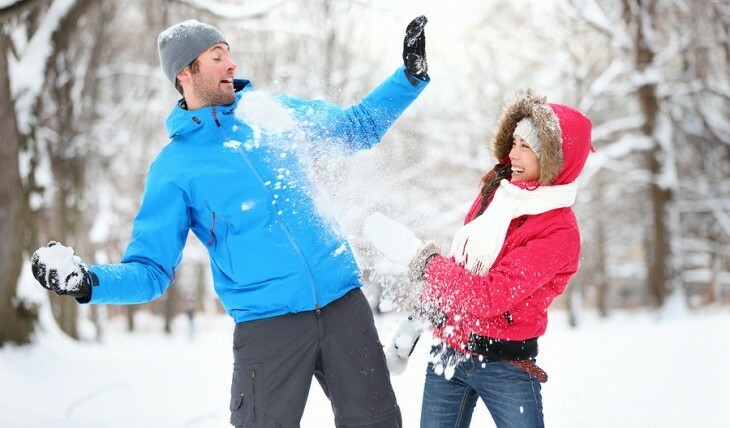 Being silly with your sweetheart is important, and playing in the snow is a great way to do it. 3. Warm up after your outdoor adventure: Heat up some good old-fashioned hot apple cider. If you’re feeling frisky, spike it with some Fireball whiskey. A warm drink with the one you love is the perfect end to a day filled with fun winter activities! How do you and your beau keep busy during the colder months? Tell us in the comments below!